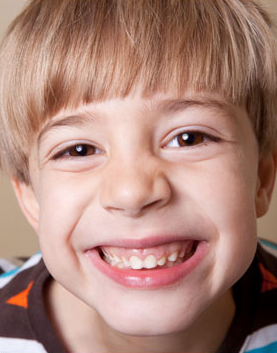 The first "regular" dental visit should be just after your child's 3rd birthday. the first dental visit is usually short and involves very little treatment. we may ask you to sit in the dental chair and hold your child during the examination. you may also be asked to wait in the reception area during part of the visit so that a relationship can be built between your child and your dentist. Suggest a schedule for regular dental visit. The first baby teeth that come into the mouth are the 2 bottom front teeth. You will notice this when your baby is about 6 - 8 months old. Next to follow will be the 4 upper front teeth and the remainder of your baby's teeth will appear periodically. They will usually appear in pairs along the sides of the jaw until the child is about 2 1/2 years old.